Lot 709, Corrosive, sells to Abdulrahman Fahad M Albawardi for 450,000 guineas ($600,608) at the Tattersalls Autumn Horses In Training Sale. Five lots sold for 300,000 guineas (US $400,406) or more on the second day of the Tattersalls Autumn Horses in Training Sale with Middle Eastern buyers dominating proceedings. The turnover and average both eclipsed the figures set on this day last year whilst the clearance rate improved to a remarkable 88 percent. The high quality three-year-old Corrosive is set to continue his career in the Middle East after being knocked down to Ibrahim Rashid for 450,000 guineas ($600,608) after he saw off the efforts of Anthony Stroud. Consigned by The Castlebridge Consignment for Hugo Palmer's Kremlin Cottage Stables on behalf of owner Vefa Ibrahim Araci, Corrosive was offered with a Timeform rating of 107. Rashid secured the son of Uncle Mo on behalf of Saudi Arabian owner Abdulrahman Fahad M Albawardi who also purchased Check Your Pockets for 115,000 guineas ($153,477) and Leigh's Law for 13,000 guineas ($17,350). Corrosive was purchased at the 2017 Tattersalls Craven Breeze Up for 150,000 guineas ($200,196) by Speers. 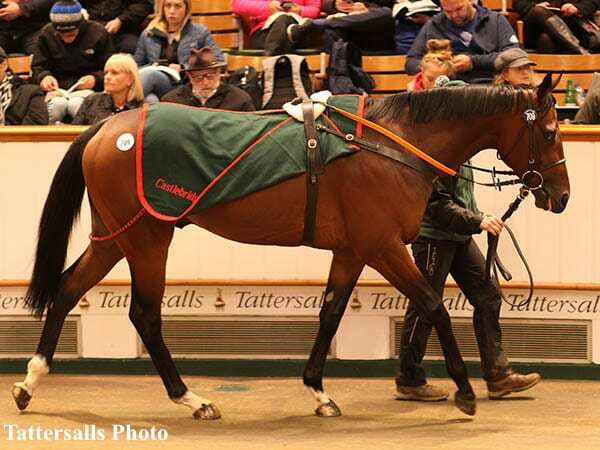 The recent Group 3 Darley Stakes winner Euginio was the star attraction on the second day of the Tattersalls Autumn Horses in Training Sale when selling to agent Oliver St Lawrence for 400,000 guineas ($533,767) on behalf of Bahraini owner/trainer Fawzi Nass. The son of Fastnet Rock, who has a Timeform Rating of 115, was secured by St Lawrence after he saw off agents Anthony Stroud and Saad Bin Mishraf. “He has been bought for the Dubai Carnival and Fawzi Naas will train,” said St Lawrence. “Euginio is a sound, willing, Group 3 winner, he goes on the good to firm and will suit racing in Dubai. We were very keen to get him,” he added. The Tattersalls Autumn Horses in Training Sale continues on Wednesday, Oct. 31. This entry was posted in Bloodstock and tagged Abdulrahman Fahad M Albawardi, Corrosive, East Everleigh Stables, Eugenio, Fawzi Nass, Ibrahim Rashid, Imad Al Sagar, Kremlin Cottage Stables, Oliver St Lawrence, Rob Speers, Saleh Al Homaizi, Tattersalls, Tattersalls Autumn Horses In Training Sale, The Castlebridge Consignment, Tony Nerses, Vefa Ibrahim Araci by Edited Press Release. Bookmark the permalink.